The third phase of ECMs to improve the energy efficiency of boilers and water heaters involves burner replacements and heat-recovery systems. New-generation burners have incorporated DDC and flame-shaping technologies to greatly improve operating efficiency throughout a unit’s range of operation. Operators can use heat-recovery ECMs on both the air side — in the form of a stack economizer — or the water side, in the form of blowdown heat recovery. Burner replacement is a higher-cost measure, but it yields attractive payback periods. Facilities in Europe have incorporated the technology advances in boiler burner design for years, validating their effectiveness. DDC technology has replaced mechanical linkages, providing significantly greater control of fuel-air mixtures. New burners control the shape of the flame and the turbulence imparted to the fuel-air mixture, enhancing fuel-to-water efficiency. To account for varying load, variable-speed drives on the fuel valve and blower fan enable turndown rates of 20:1. Improved turndown means higher efficiencies at all but peak-firing rates, which happens for only a fraction of the heating season. Burner replacements have the greatest impact on reducing the use of heating fuel. While replacing burners represents a major investment, they offer simple payback periods of two-four years, depending on the burner-tip fuel rate and boiler use. Energy is extracted from the products of combustion and directed to preheat combustion air or boiler feed water. Candidates for economizers have a high load factor — average load divided by maximum load — and stack temperatures greater than 500 degrees. The economizer includes two heat coils — one in the breaching and one in the make-up air — and a small circulating pump. Combustion air typically can be heated to 300-400 degrees, depending on the burner’s construction. Installing a heat-recovery system lowers the stack temperature, and it increases the make-up-air temperature. Boiler efficiency increases by about 2 percent for every 100 degree decrease in the stack temperature. A second method of heat recovery involves diverting energy contained in hot blowdown in order to preheat make-up water or for some other low-grade thermal energy use in the central plant. 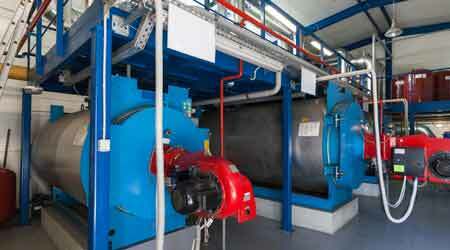 Candidates use continuous boiler blowdown and have a continuous load that can use this waste energy. This system consists of shell-and-tube or plate-and-frame heat exchangers and a small pump to circulate water between the heat source and the sink. Boiler efficiency improves by about 1 percent for every 10 degree increase in make-up water. Heat recovery of 20-30 degrees is typical. Overall efficiency improvement is 2-3 percent.